I’ve been conducting research on the best times to do your online marketing activities like blog, email, Tweet, and post to Facebook for close to 3 years now. The timing consistently been one of most popular elements of all my datasets. And now I’ve finally compiled all that research into one huge webinar (20,000 people are already registered for it). It will take place on Tuesday, march 29th and 1PM EST, so go register now! The webinar will feature custom hold music by DJ David Gallant and a Twitter after-party, where experts will answer all your marketing and timing-related questions on the #TimeSci hashtag. In preparation for the webinar I developed a free tool called TweetWhen. Enter your Twitter username and it will give you two customized graphs showing you what times and days you get the most retweets-per-tweet. 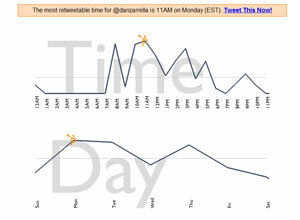 Think about it as a “Most ReTweetable Times” graph built especially for you!